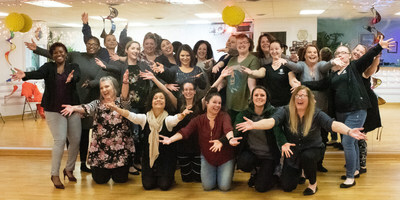 CINCINNATI, April 16, 2019 /PRNewswire/ -- Air Force veteran Tamara ODonnell joined other female veterans at a Wounded Warrior Project® (WWP) women's wellness weekend. This event brought together veterans and their family members in a welcoming environment that fostered healing and relaxation. "This weekend made me feel more confident and more connected. And I plan to look up more self-defense and kickboxing classes. I had forgotten how much I enjoy it." Participants used the weekend to focus on their well-being and share experiences while learning about meditation, tai chi, self-defense, nutrition, dancing, water aerobics, resistance training, and essential oils. WWP organizes events for female warriors and caregivers to provide a comfortable environment for women to connect to each other and their communities. Tamara called this a "safe space" where she and others could share experiences that remind female veterans and caregivers that they are not alone, and that in taking care of themselves they are also caring for their families. "Self-care is critical," Tamara added. "If you don't make time to care for yourself, you won't have the energy to care for others, and you can eventually feel burnt out." Caregiver Briana Mastriana, whose husband is an Army National Guard veteran, agrees. "I would say being a caregiver is a unique experience, especially as a caregiver to a wounded veteran. "Getting involved is important, not just to have the respite, but also to communicate thoughts and ideas to others who understand your situation," Briana added. Participants created a Facebook group to send motivational quotes and encouraging comments to each other. Some of them plan to meet on their own to share progress toward health goals and just chat. To learn more about how WWP connects warriors and caregivers to build strength through community, visit https://wwp.news/GetConnected.